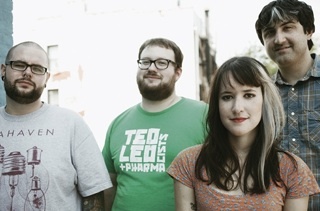 Candy Hearts frontwoman Mariel Loveland has announced the band will start recording their new album next month. A message from Mariel can be read below. "In one month we’re going to be flying to LA to record our second LP. I’m BEYOND EXCITED. I’m ready to do this again. So ready. I was born for this. I was made for this. The best part is we all get to sit together on the plane instead of with strangers, who inevitably regret sitting next to the drugged-out, homeless looking girl hysterically reciting the rosary during takeoff and crying (aka me). This LP has been a long road for me and it’s nowhere near finished. I feel like I suffered from the most awful writers block. I would go on tour almost looking for trouble to have something to write about. I probably say that every time I’m trying to write, but when the record is finished I only remember the few effortless minutes of finding the perfect words to describe my life and the perfect way to lock them into a melody forever. I’m not hiding the fact that I become a crazy person when I’m writing- a hermit who could live in her apartment for weeks on end feeding only on scraps of chinese food leftovers and Goldfish crackers. My momma calls every so often to lovingly tell me I need so much therapy it’s ridiculous and my friends wonder about that girl they used to hang out with who had that purple streak in her hair but can’t recall her name or number so they don’t call. Such is the life of an artist. Writing is an all encompassing thing for me. I don’t have time for the outside. And now that it’s almost over, I’m feeling good, I’m feeling normal, I’m feeling ready to hit it with all we’ve got. To not be a hermit and to see the world! To see all of you in your cities and sing! I feel like so much has happened to our band and we’ve been on so many adventures together and done so many things. People we love have come and gone, we have come and gone, we’ve cut toxic people who we used to consider family out of our lives, felt the deep pain it feels to realize that people change for the worse and felt the joy that comes with knowing you’re better off and you have a long, wonderfully uncertain future ahead. The certainty of being in something together with all of your being. We’ve struggled, as does any human in their 20s (or 30s or 40s or pretty much since you pop out of the womb). But we all agree that there is nothing better in the whole world than making something with your best friends and that feeling of hitting play on the cd player for the first time, knowing you made something out of nothing and now it exists. And that feeling of seeing unfamiliar cities at sunrise and knowing you and your best friends are the only people awake on a dark, seemingly endless stretch of desert. The excitement of not knowing where you are going to end up. Thank you guys for following us on this pitch black, foggy, but beautiful road, where we put one foot in front of the other and work the hardest we can without knowing what’s to come. We cannot wait for 2014."